If the foothills west of Denver could tell us their history, we’d hear tales of miners trudging up into the mountains in search of gold—some with horse or oxen drawn wagons, heavy with food, clothing, supplies and mining equipment. This area was settled in the 1800’s by pioneers who created small supply towns for miners near the bases of the canyons which contained wagon trails (toll roads) providing access to gold mines in the mountains. These included the settlements of Mt. Vernon Town, Apex, Arapahoe City, Golden City and Golden Gate City. To satisfy my curiosity about the history of the foothills area, I’ve been going on “historyadventures,” hitting the hiking trails to check out some of the historical sites in the foothills. Here’s another of my history adventures—hiking the old Apex Toll Road that carried miners to the gold mines in Black Hawk, Central City and Idaho Springs. Pioneers were lured west in the 1850s by the possibility of striking it rich and a desire to escape from the economic hardship that was plaguing the rest of America at that time. Some were passing through Colorado on their way to take part in the California Gold Rush (1848-1855), but stopped instead in Colorado, where placer gold was being found in great quantities in the creeks, and miners were working mines in Greggories Diggins (Black Hawk) and Chicago Creek Diggins (Idaho Springs). Some shrewd businessmen realized that they didn't need to work the mines to strike it rich—they could make money off of the miners. Some of these entrepreneurial pioneers created small supply towns. Others built roads connecting the miners and their diggins to suppliers and purchasers for their gold. One such road was the Apex Toll Road. “Official--by Authority. Laws of Colorado Territory,” Daily Colorado Republican and Rocky Mountain Herald, October 17, 1861. Colorado Historic Newspapers Collection. Colorado State Library. The road started at the intersection where the St. Vrain and Golden Road intersected the “Jackson Trail” a road from Cold Springs Ranch (present day Camp George West), and ran southwest to enter the foothills at Amos Gulch. Brown, Georgina, The Shining Mountains, 1976, p. 36. This route into the mountains became so popular that a small supply town cropped up at the base of the foothills. Apex, as the town became known, was described in the Rocky Mountain News as comprised of a number of temporary buildings and tents, until 1864 when a stage coach stop was built. Shining Mountains, p. 36. Apex Gulch (date uncertain, pre-1950s), Negative #1167-S WPA, NF-Apex Gulch, History Colorado (subsequent use requires written permission from History Colorado). This photo shows Apex Gulch before the Magic Mountain amusement park was built. A faint trail appears to cut across the base of the hill on the left side of the gulch. From Apex, the road scaled Lookout Mountain (northwest of Heritage Square) and continued through Floyd’s Ranch and over Big Hill (Floyd Hill), then followed North Clear Creek to Gregory Gulch (Central City and Black Hawk) with a branch to Russell's Gulch (Idaho Springs). Historic Contexts Reports, 1999 – 2002 Cultural Resource Survey of Unincorporated Jefferson County, Cathleen Norman, Preservation Publishing, 2002 (prepared for the Jefferson County Historical Commission), p. 19. The Apex Road appears on this 1861 map titled Map Showing the Location of Clear Creek and its Tributaries; also the principal roads leading from Denver to the gold mines in Clear Creek and Gilpin counties, Colorado territory. Scan #30001402, History Colorado (subsequent use requires written permission from History Colorado). This map shows the Apex Toll Road merging with the Mt. Vernon Toll Road at Genesee. At the mouth of Amos Gulch, the altitude is about 600 feet greater than Golden city, up Amos Gulch the road is well-built, Creek crossings all culverted. The summit of the mountains is gained with an easy grade of a little over 2 miles. The big hill has been graded so that one yoke of cattle can draw up it 2000 pounds. Foster, W.M.S., civil engineer, Apex Road, Daily Colorado Republican and Rocky Mountain Herald, July 18, 1861, p. 2, c. 4. Colorado Historic Newspapers Collection. Colorado State Library. In an advertisement for the toll road, local businessman John A. Nye urged locals to “save time!” “save toll!” by taking Apex Toll Road which he proclaimed was the “only Natural way to get into or across the mountains,” and the “shortest and best way to Gregory and vicinity.” Nye, John A., “Take It”, Weekly Commonwealth, July 23, 1863, p. 3 c. 5, Colorado Historic Newspapers Collection. Colorado State Library. JNO A. NYE, “Mt. Vernon and Gregory, the Apex, Road,” Rocky Mountain News, July 29, 1865. P. 2, c. 3, Colorado Historic Newspapers Collection. Colorado State Library. Use of the Apex Toll Road stopped after part of the road was damaged by flooding in 1878 and 1879. Today, there are no visible remnants of the settlement of Apex or its toll road, other than the dirt trail that winds its way up Lena Gulch. The last building in the settlement of Apex was destroyed in October of 1893 when the house of local ranch owner Jochim Binder burned down. Shining Mountains, p. 40. Binder was a Jefferson County Commissioner from 1884 to 1887 and was referred to as the “Mayor of Apex” by one satirist in articles written in the Globe in 1880. Shining Mountains, p. 40; Jefferson County Archives, Binder, Jochim. The last remnants of Apex were beehive-shaped brick structures, which some thought were used as lime kilns or as cheese storage vaults. Shining Mountains, p. 40. Today, the land surrounding Apex Gulch is heavily developed, with a residential housing community to the north (Heritage Dells), and a gravel quarry to the South operated by Martin Marietta (Spec Agg Quarry). The base of Apex Gulch has been the site of an amusement park for the last 58 years. Magic Mountain, a western frontier village theme park, was built in 1957 and failed gloriously by 1959. Jefferson County Open Space, Apex Park History. Heritage Square operated as an amusement park paired with a Victorian-style shopping village beginning in 1971. Id. The village and the alpine slide closed in 2015; but the amusement park will continue to operate on the site, along with a restaurant and picnic area. At year's end, Heritage Square in Golden will be only Memories, by Josie Klemaier, The Denver Post, July 2, 2015. It is not clear how the land will be developed in the future. Northeast of the mouth of Apex Gulch (January, 2016). Apex Park facilities and Heritage Square are seen in front of the gulch. The land in and north of Apex Gulch was purchased by Jefferson County over several years beginning in 1974, and designated as an open space park. Jefferson County has done an exceptional job of developing and maintaining 9.6 miles of hiking and biking trails heading up the gulch and along Indian Mountain, just north of the gulch. Hikers, mountain bikers and trail runners use the trail year round. Jefferson County commemorates the old toll road with a sign near the start of the trail describing the history of the trail and the amount of tolls charged. The Apex Trail begins in the parking lot north east of Heritage Square. It is doubtful that the first section of the Apex Trail lies in the tracks of the old toll road. The toll road passed through the town of Apex, which was located at the site where Heritage Square sits today. The current Apex Trail skirts around Heritage Square to its north. The trail quickly heads into Lena Gulch (the current name for Amos Gulch) and tracks along the side of the creek that runs down the gulch. Based on historical accounts of the Apex road, the creek-side portion of the trail appears to follow the old toll road. The Apex Trail climbs steadily up Lena Gulch for several miles, intersecting the Argos Trail about a half mile from the parking lot, the Pick-N-Sledge Trail at one mile and again at two miles in, and the Enchanted Forest Trail, which travels through a beautiful forested area and can be used to create a loop. The entire Apex Trail is about 3.0 miles from the bottom of the gulch to its terminus at Lookout Mountain Road. From there, an informal trail continues through a residential area to connect with the Lookout Mountain Trail at the Lookout Mountain Nature Center. Today, Apex Park attracts both hikers and mountain bikers who all enjoy the “gentle grade” so appreciated by the pioneers heading west. The trail can be hiked during any season. In spring and early summer the trail offers a variety of wildflowers along with spectacular views of the foothills and Denver. Brown, Georgina, The Shining Mountains, B&B Printers, 1976. At year's end, Heritage Square in Golden will be only Memories, by Josie Klemaier, The Denver Post, July 2, 2015. Robbins, Sara E., Jefferson County Colorado, the Colorful Past of a Great Community, published by the Jefferson County Bank in 1962. Foster, W.M.S., civil engineer, Apex Road, Daily Colorado Republican and Rocky Mountain Herald, July 18, 1861, p. 2, c. 4. Colorado Historic Newspapers Collection. Colorado State Library. Nye, John A., “Take It”, Weekly Commonwealth, July 23, 1863, p. 3 c. 5, Colorado Historic Newspapers Collection. Colorado State Library. Jefferson County Archives, Binder, Jochim, http://jeffco.us/archives/history/commissioners-chronological-list/binder,-joachim/. Historic Contexts Reports, 1999 – 2002 Cultural Resource Survey of Unincorporated Jefferson County, Cathleen Norman, Preservation Publishing, 2002 (prepared for the Jefferson County Historical Commission). 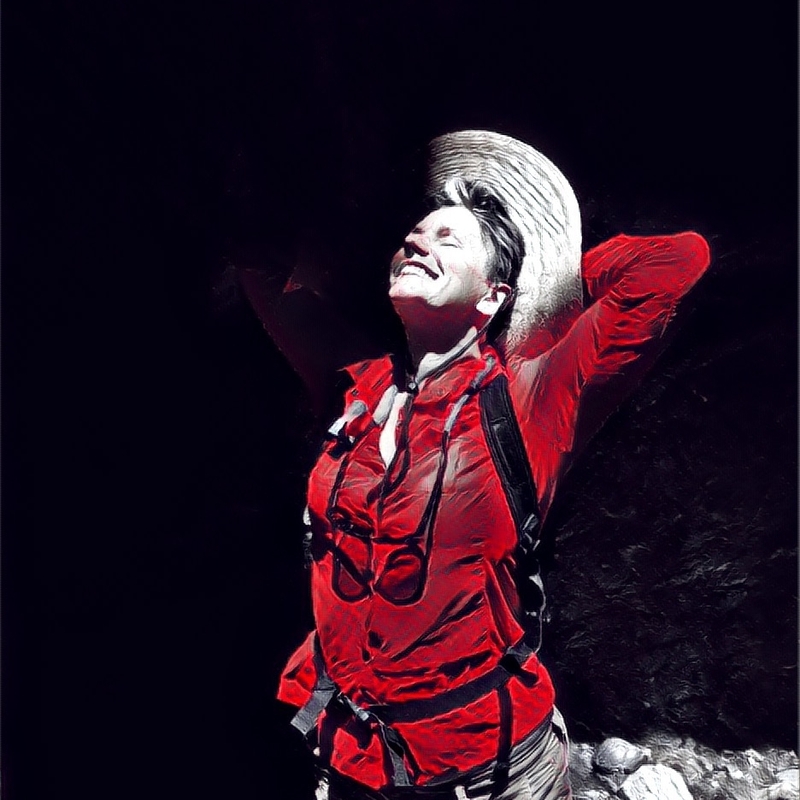 Check out more blogs by hiking enthusiast Lee Katherine Goldstein! A beautiful day of bouldering in Colorado's newest state park.